Healthy ecosystems and a rich biodiversity are vital for human welfare and survival. Ecosystems provide a multitude of benefits to people. These range from food, clean water and raw materials to flood protection and cultural heritage. However, climate change and the shifts in land use can alter nature's ecosystems and the habitats that support life, from oceans to forests. To address some of these challenges, the EU-funded ECOPOTENTIAL project has been focusing on internationally recognised protected areas (PAs), including mountain, arid and semiarid, and coastal and marine ecosystems. One of the PAs covered by the project is the mountainous Sierra Nevada National Park in Andalusia. As explained in an article by the United Nations Environment Programme, water management in the Park is key to sustaining economic activity and ecosystem functioning. The irrigation channels on the mountain slopes of Sierra Nevada that date back to the 9th century divert water from the springs and streams at higher altitudes. Then, they deliver it to the lower-lying crops, grasslands and forests. "This process slows down the hydrological cycle, making good use of the water resources." Several economic activities in the region, such as agriculture, tourism, cattle raising, bee-keeping and mining, are highly dependent on this water, as are all downstream towns and villages. Climate change has already altered the hydrology of Sierra Nevada, impacting both ecosystems and communities. "At the same time, land-use change is another key driver of ecosystem structure and functioning." 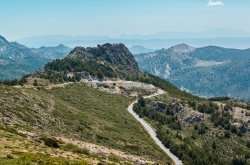 The same article adds: "As part of its ground-breaking ECOPOTENTIAL project, the European Union has been using satellite images to assess how this network of channels is affecting the functioning of socio-ecosystems in Sierra Nevada." It also emphasises that quantifying some of the effects of the watering provided by these channels can assist policymakers to "better understand how irrigation channels can mitigate the impact of climate change in the region." According to the project website, ECOPOTENTIAL blends "Earth Observations from remote sensing and field measurements, data analysis and modelling of current and future ecosystem conditions and services" in several PAs in Europe, the Caribbean, Israel and Kenya. The ongoing ECOPOTENTIAL (ECOPOTENTIAL: IMPROVING FUTURE ECOSYSTEM BENEFITS THROUGH EARTH OBSERVATIONS) project also aims to develop a methodology that can be extended beyond the selected PAs. "Building on the knowledge gained in individual PAs, the ECOPOTENTIAL project addresses cross-scale ecological interactions and landscape-ecosystem dynamics at regional to continental scales, using geostatistical methods and the emerging novel approaches in Macrosystems Ecology, which is addressing long-term and large-scale ecological challenges." The data and model results of ECOPOTENTIAL are made available on common and open platforms, "coherent with the Global Earth Observation System of Systems (GEOSS) data sharing principles and fully interoperable with the GEOSS Common Infrastructure (GCI)."